Here at ChiIL Live Shows/ChiIL Mama we caught The Table last year and highly recommend it! Moses, the charismatic cardboard character, has heart, soul and depth. We were inspired by and enamored with this cranky curmudgeon. The Table is a must see! Chicago Shakespeare Theater (CST) presents productions from the UK and the Netherlands as part of CST’s World’s Stage Series—Blind Summit’s The Table and the US premiere of Freeze! from performer Nick Steur, January 14–25, 2015. These offerings headline the inaugural Chicago International Puppet Theater Festival, a celebration of dynamic and inventive puppet performance in cultural institutions across the city. Returning to Chicago Shakespeare from the UK after a critically acclaimed run in 2013, The Table features the unforgettable Moses, a cantankerous and loveable puppet with a cardboard head facing an existential crisis—on a table. 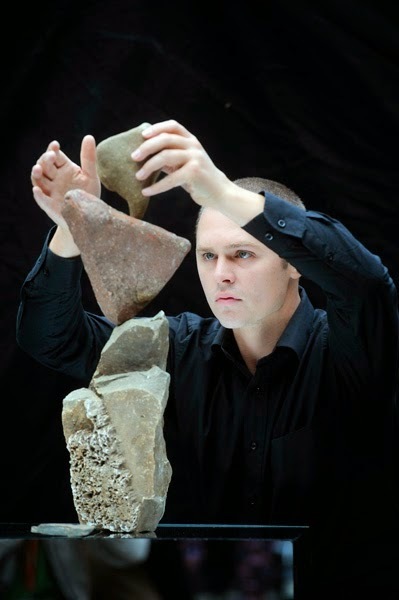 In Freeze!, Dutch performer Nick Steur astounds audiences as he artfully balances stones without glue or other manipulations, challenging traditional conceptions of performance to dazzling effect. At the forefront of exciting international theater practices, The Table and Freeze! are performed in tandem at Chicago Shakespeare throughout the two week-long festival. The Table is created in the Japanese Bunraku style, performed completely on the table top with multiple puppeteers visible to the audience. 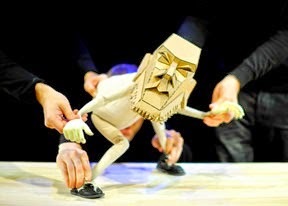 Blind Summit’s puppeteers breathe poignant life into the character using humor and improvisation, revealing something of ourselves in the cardboard, wood and fabric creation on stage. Founded by Mark Down and Nick Barnes in 1997, Blind Summit Theatre is reinventing puppetry for modern adult audiences, bringing together internationally renowned puppetry innovators to devise new works and engage in stunning collaborations. London’s The Guardian declares Blind Summit to be “the UK's puppet masters, a company whose shows have proved that puppetry doesn't have to come either with apologies or strings attached." In addition to The Table, Blind Summit will also present late night showings of a new work-in-progress following the evening performances on Fridays and Saturdays during the festival. Founded to establish Chicago as a center for the advancement of the art of puppetry, the city-wide Chicago International Puppet Theater Festival will showcase an entertaining and eclectic array of puppet styles from around the world, including marionettes, shadow puppets, Bunraku puppets, tiny toy puppets, and distinctive, innovative styles of contemporary puppetry. Nearly 50 different performances are slated, showcasing more than 50 artists and a dozen puppet theater acts from around the globe. Chicago Shakespeare joins the Art Institute of Chicago, Museum of Contemporary Art Chicago, Field Museum of Natural History, The Second City and other Chicago cultural institutions in the week-long festival. For more information, visit www.chicagoshakes.com/thetable and www.chicagoshakes.com/freeze. A full performance listing for the Chicago International Puppet Theater Festival can be found at www.chicagopuppetfest.org. The Table and Freeze! are presented January 14–25, 2015 at Chicago Shakespeare Theater. Tickets for The Table are $20-$35 and tickets for Freeze! 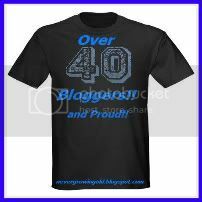 are $10-$15. All patrons receive a 40% discount on guaranteed parking in Navy Pier garages. For more information or to purchase tickets or a season subscription, contact Chicago Shakespeare Theater’s Box Office at 312.595.5600 or visit www.chicagoshakes.com. Chicago Shakespeare Theater (CST) is a leading international theater company and the recipient of the Regional Theatre Tony Award®. Under the leadership of Artistic Director Barbara Gaines and Executive Director Criss Henderson, CST is dedicated to producing extraordinary production of classics, new works and family fare; to unlocking Shakespeare’s work for educators and students; and to serving as Chicago’s cultural ambassador through its World’s Stage Series. Through a year-round season encompassing more than 600 performances, CST attracts 200,000 audience members annually. One in four of its audience members is under eighteen years old, and today its education programs have impacted the learning of over one million students. CST is proud to take an active role in empowering the next generation of literate, engaged cultural champions and creative minds.